This is a very reliable, quick and easy recipe. We make it almost every week. Mix the above items in the measuring cup. The hot water will dissolve the sugar and melt the margarine. Stir well. While this mixture cools, grease the pan. You can use a bundt or cake pan. I have successfully used a "Viennese Swirl" 12-inch diameter round pan, but the texture is best with the bundt pan. I like to put a larger pan underneath the bundt pan, (or, sometimes, a sheet of heavy foil around the outside) to catch any potential drips. In a small bowl, beat 4 to 5 eggs with a fork. 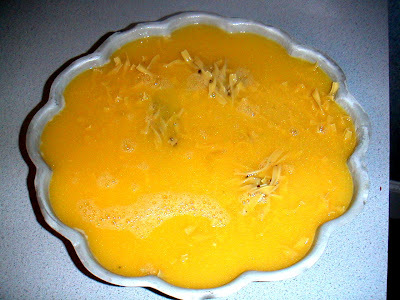 Temper the mixed eggs by putting a small amount of the cooled mixture in the bowl and mixing with the fork. Pour the eggs over the noodles in the pan. Pour the mixture over the eggy noodles in the pan. 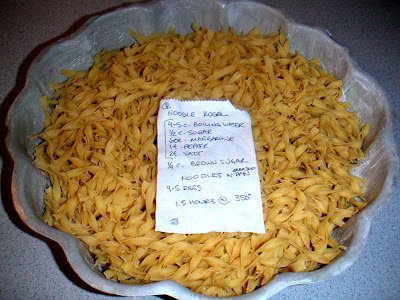 If there are exposed noodles, add a bit more water to cover them. This is a picture of the eggy-liquid mixture on top of the uncooked noodles in the greased pan. Bake at 350 degrees F for an hour and a half. I'm confused. If you only add a little of the sugar mixture to the eggs to temper them, when do you add the rest of the liquid to the bundt? Is it one big mixture poured over the uncooked noodles or two separate additions and if so, what is the correct order? As long as the eggs are tempered before they have to contend with that big amount of hot water, it should work well. I often cheat a little when making this, and use my "instant hot" as the boiling water, poured directly in the measuring cup over the sugars and the margarine. This eliminates the need for a pot and makes the whole thing go together very fast. I hesitated to add this cheating bit in the recipe, because not everyone has an "instant hot" dispenser in their sink. But now, my secret's out!